What can I say, I just can't stay away from neon. With white jeans, it seems perfectly summery. Thank goodness for the break in the heat this week, I like being able to break out a pair of jeans every now and then. I love neon and white! I just wore it in my post yesterday, I think it's so perfect for summer. I really need to go get these old navy jeans. All the bloggers have them and they always look so nice! my white jeans stretch out in the knee way too fast. 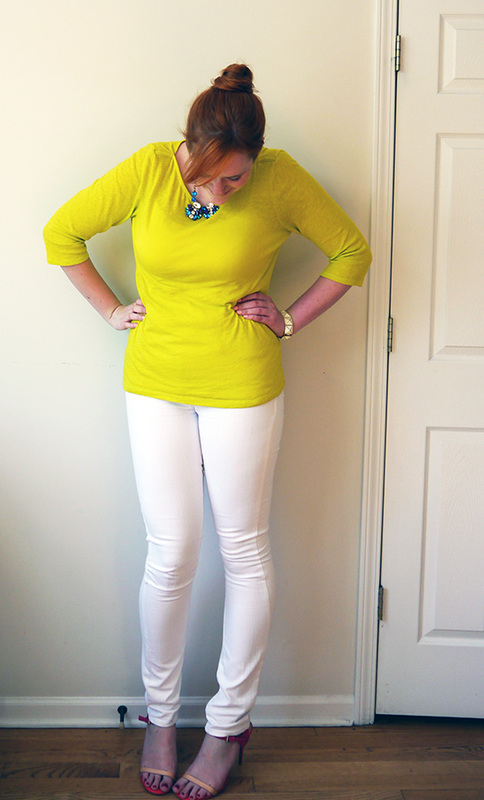 Love this color combo–the white jeans make the neon look even brighter! I like that you pulled in other colors in the necklace! It gives it some contrast! Im with you! 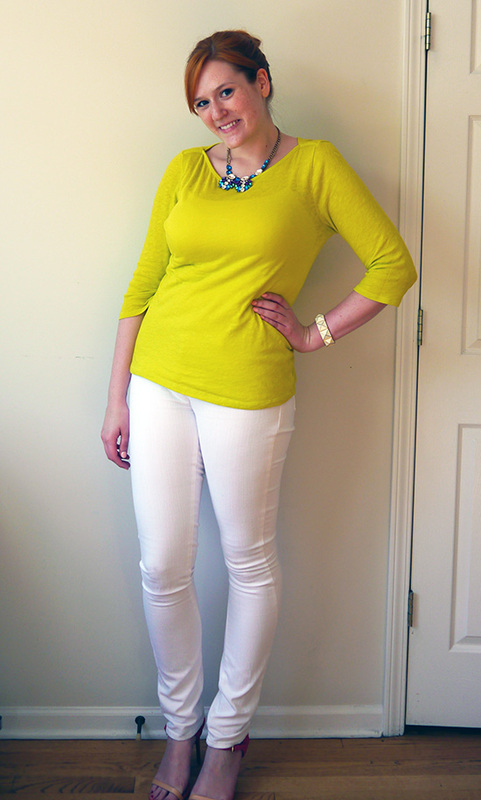 I cannot get enough of neon and white jeans. Lovely outfit and I love that necklace. This color combo is so perfect for Summer. Love those sandals! How haven't I noticed how long and lovely your legs are! Gorgeous! 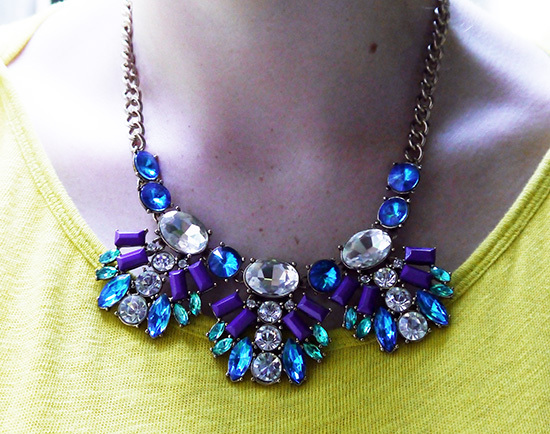 And neon is so gorgeous on you, don't stop wearing it! Love the necklace with the top! Love this outfit so much! You look fantastic! 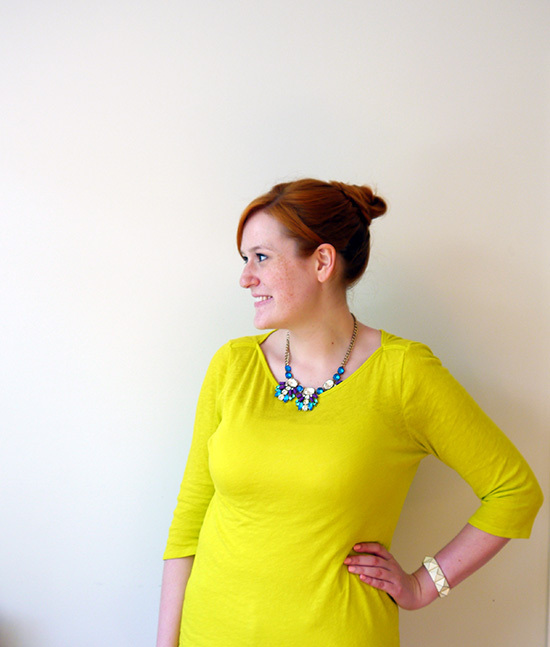 We're blog post twins today with the bright tops! Looooove it!! Neon is my favorite part of summer, hands down. what a happy color! Obsessed with your pretty necklace! You're the real deal in those pants! I can't believe how good you look in them. And I'm seriously always loving the bright yellow on you. Those white jeans look freaking hot on you! And holy long legs. :) I love your pretty sparkly necklace. Love that necklace! Sooo pretty!